Dominique continues to be the happiest, hardest working person I know. Her persistence and determination has helped her expand her vocabulary through the use of her iPad. With this advancement in communication, we have learned a lot about Dominique and her adorable, funny personality. We have learned that Dominique loves the Frog Song. But only the version she learned from Miss Jennifer’s class while she was at Easter Seals. She also enjoys dancing and listening to “Shake It Off” by Taylor Swift. She has also made it quite clear that she does not like moms out of tune version. In her spare time she lets us know that she would like to stop at the Starbucks for a Vanilla Bean Frappuccino and check out the toy department at Target which she refers to as the “Target Playground.” She has also taught herself to play the piano. She loves to go on YouTube to find songs and piano tutorials so she can replicate on her piano. Currently, through the help of her piano teacher and therapist, she is working on The Beatles, “I Want to Hold Your Hand.” I just want to hold hers forever. This entry was posted in child stories, Uncategorized and tagged Easter Seals, Easter Seals of SEPA, Easter Seals of Southeastern Pennsylvania, Walk With Me on January 29, 2016 by Easterseals. I recently had the pleasure of doing a program presentation for the board of trustees at Easter Seals. 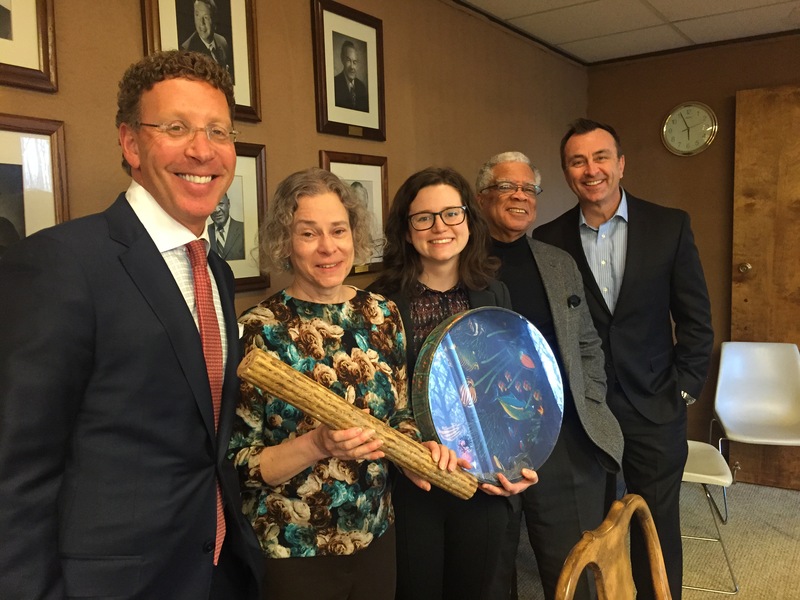 I began my presentation by bringing a bunch of percussion instruments from my office to the board meeting. Initially, I got a couple of inquisitive looks and some daring board members experimented with some different things. Whenever I am talking to a large group about music therapy I like to begin the presentation with a drum circle. It was around 7pm and I can imagine most people had been working up until this point. To begin the drum circle I usually pick a drum for myself that I am comfortable with, that has a full sound. I play a simple beat for a little while then invite the group to join when they feel like they have something to add. After the group seems to “get in the groove” I begin isolating different parts of the room i.e. “on the count of 4, just the people wearing green!” (this was on st. patricks day), the right side of the room, the left side etc. Towards the end, i say, “on the count of 4, i want you to play as loud as you can!” then we play as loud as we can and i count down from 5,4,3,2,1 and we stop. Being a therapist I can’t help assess the group before and after the musical experience.Before I noticed some were hesitant, but some seemed excited. During the music I noticed lots of laughing and smiling, the music continued to become more cohesive with all the participants playing with each other, and the volume increased as we continued playing, as well as the cohesiveness of the playing. After the musical experience I noticed a shift in my mood as well, I felt more relaxed and more confident about my presentation. I believe that music has the power to center us. It was great to get to interact with the board members and share the work that we do at Easter Seals. Sometimes I think we are so busy thinking about how to better serve the students at Easter Seals, that we don’t always get a chance to take a step back and think of all the great work we do here. I thought this was a great question. I guess an easy answer might be, “i deem a group successful if my goals for said group are met.” When i really think about this question, I realize that sometimes I work in the opposite way. Some days in order to meet the needs of the students I have to take the temperature of the room in order to decide which steps/interventions I will use that day. This reminded me of how Easter Seals has helped me become very flexible! Because I see about 30 groups a week, I often try to pick interventions that are adaptable for most groups. Sometimes I build an idea around a theme or season, sometimes around something the kids are really interested such as the movie Frozen! I then break things down and think about all my different classes and how they might respond to the music. I can’t always predict what the kids will do, so sometimes I also edit the idea as I use in in sessions. Thinking about these questions and this presentation really allowed me to reflect on my experience as a music therapist here, and I appreciate that! This entry was posted in Uncategorized on April 24, 2015 by Easterseals.